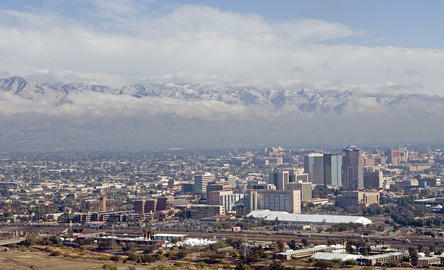 In the first study to attempt to quantify the impact of rapidly expanding megapolitan areas on regional climate, a team of researchers from Arizona State University (ASU) and the National Center for Atmospheric Research has established that local maximum summertime warming resulting from projected expansion of the urban Sun Corridor [the four metropolitan areas of Phoenix, Tucson, Prescott and Nogales] could approach 4 degrees Celsius. This finding establishes that this factor can be as important as warming due to increased levels of greenhouse gases. Their results are reported in the early online edition (Aug. 12) of the journal Nature Climate Change. “The actual contribution of urban warming relative to summertime climate change warming depends critically on the path of urbanization, the conversion of natural to urban landscapes, and the degree to which we continue to emit greenhouse gases,” said Alex Mahalov, a co-author and principal investigator of the National Science Foundation grant, “Multiscale Modeling of Urban Atmospheres in a Changing Climate,” which supported the research. Thanks. Very useful. Also, cause for regret. “However, pinning precise figures on the relative contribution of each effector is difficult” (the referenced article). Ok. Those of us who are practitioners in this field never got around to providing precise figures. Too busy getting positive results. Mea culpa. Failed to anticipate that a bunch of know-nothings would invade the territory. “White Roofs May Successfully Cool Cities, Computer Model Demonstrates “. Whaaat … Expletives deleted. Classic “rediscovering the bleedin’ obvious” this one. “Water Evaporated from Trees Cools Global Climate, Researchers Find”. Tree planting in belts (can be savanna woodland, doesn’t need to be dense) raises the boundary layer. Extensive belts can significantly modify the micro-climate, even the level of precipitation if large enough, but don’t overlook the build-up of fuel load. It is no accident Arizona State runs the largest center for Sustainability in the US. Which of course has little to do with the environment or temps and everything to do with control and money. I know from my work involving what is really going on in Australian education that this cultivated Newmindedness and non-Axemakers Mind is relevant here as well. Moreover this link will show the fit with the Regional Equity Movement so that readers can be on the look out for that statist tool as well. I have mentioned before that Australia is a part of the Belmont Forum and thus the Future Earth Alliance mentioned in the post. It is located in Sweden and works with the UN agencies to transform Western societies and economies around Sustainability. Including personal behaviors and how people think. Or whether they can.